Long Term Bearish Cycle Ending? It’s far too premature to be overly bullish, but changes due seem to be afoot, mostly due to changes in world currencies since late 2016. Much of our longer term bearish outlook since 2014 has been centered on weak currencies in major exporting countries, which works to sustain producer revenue and acreage expansion in definitely. However, this has changed. 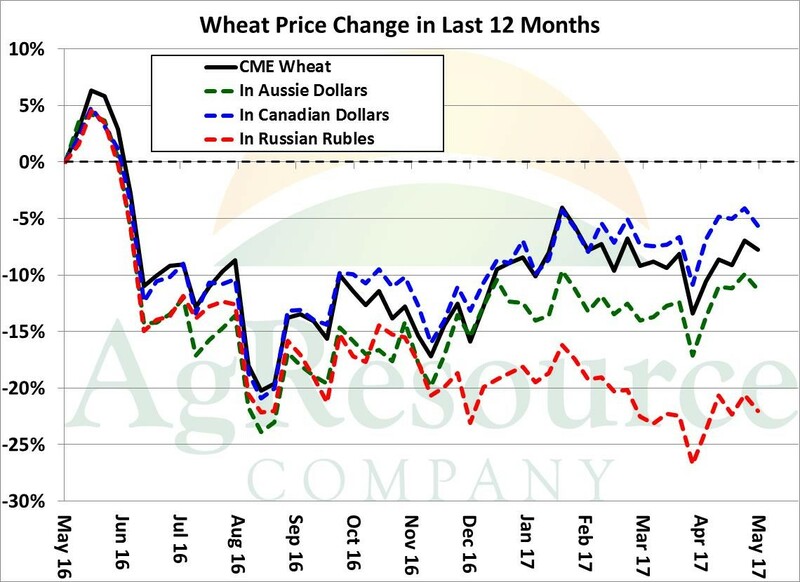 The graphic above displays spot CME wheat futures valued in other currencies, and notice that all major exporters are worse off than they were a year ago. This is especially true in Russia, where domestic cash prices are down some 10-15% from a year ago. The same is true with respect to corn in South America, and the boom appears to have ended. 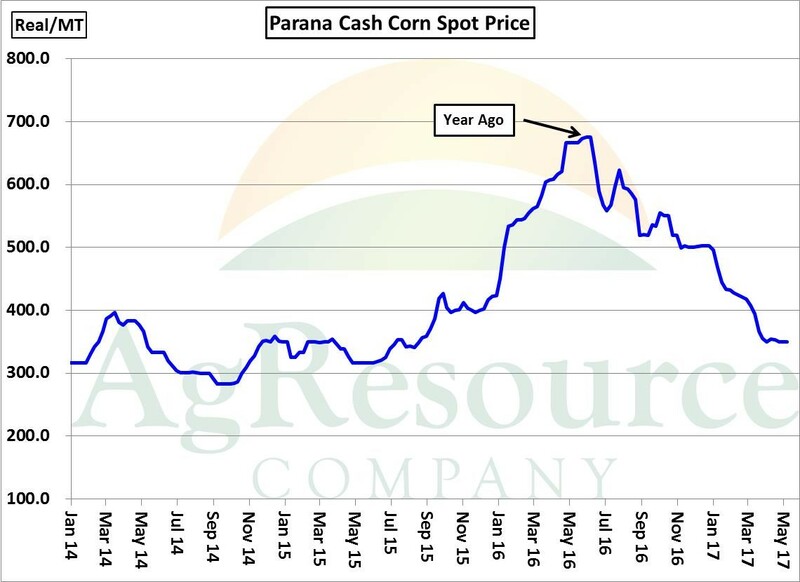 Cash corn prices in Southern Brazil have now retraced the entirety of the post 2014 rally, and no longer is there as much incentive to maintain ever expanding planted area. Weakness in the US dollar, additionally, has allow the US to be rather competitive in the world market, and corn, wheat and soybeans at the US Gulf are the world’s cheapest origins for delivery into mid-summer. This is not anything than can be traded in any given day or week, but without non-US acreage expansion, and assuming trend yields and trend consumption growth, global grain ending stocks do look to correct in the years ahead. 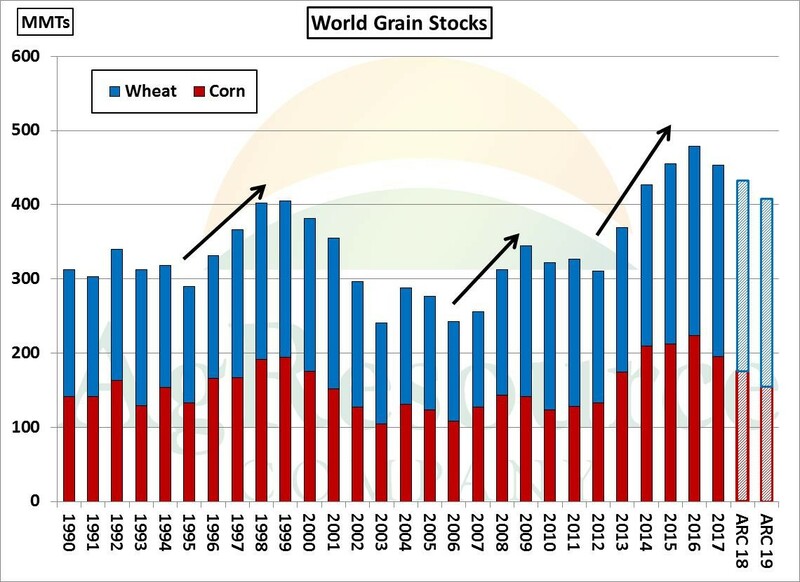 Stocks-building periods tend to last 3-4 years, and 2016/17 marked the fourth consecutive year of increasing global end stocks of corn & wheat, and without producer incentive, supply and demand should be much more balanced into 2020. Old crop global end stocks are record high, and the market must work through these inventories near term, which argues against lasting rallies. But beyond summer, a more supportive market structure is expected. Multi-year lows ($3.01, basis spot corn, and $3.62, basis spot CME wheat) were very likely scored last autumn, and as such we’re in no rush to add to cash sales at current prices.